I remember when there were only a few bars available at the supermarket, and they were all high-protein, high-calorie bars targeted at serious athletes. Today, there are so many types of bars for sale (they fill a whole wall at my local Whole Foods), it is overwhelming to determine which ones are even worth looking at. And unfortunately, many of them are packed with ingredients like sugar that make them really high calorie, or sugar alcohols that make them undesirable. I've personally been a big fan of Luna brand bars for a long time, as I like what they stand for -- nutrition for women (although men can totally eat them too!) & natural ingredients, combined with great taste. Unfortunately, the traditional Luna bars are a bit higher in calorie (at 180 calories), so I don't eat them on a regular basis (cookies and cream is my favorite flavor). I rarely find food to be too sweet, but there are even a few flavors of regular Luna bars that are so sweet that I actually don't like them. If you are curious which ones, send me an email, and I'll fill you in. Luckily, a little while ago Luna came out with a lower calorie, yummy, mint chocolate flavored "tea" bar I really love called a Luna Tea Cake. This bar is really different than most bars in that it is a bit more like a soft tea flavored cookie with subtle but tasty flavoring, than a dense protein filled bar. I like that the bars contain tea in them, as tea is full of healthy antioxidants. 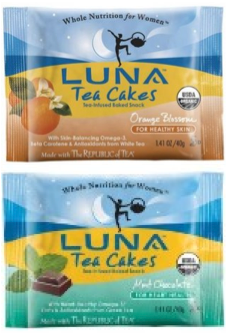 The Mint Chocolate (my personal favorite) and Orange Blossom flavors of the Luna Tea Cake are 130 calories, and only 2 weight watchers points. The other two flavors, berry pomegranate (140 calories) and vanilla macadamia (150 calories) are 3 WW points. I buy Luna Tea Cakes at Whole Foods, ans I also made them available at the Yummy Diet Food Amazon Store (although unfortunately Amazon doesn't sell the mint chocolate flavor). Oooo... Thanks for the heads up. I will pick some of these on my next shopping trip. I agree that that some of the regular luna bars are on the sweet side.